CHICAGO--(BUSINESS WIRE)-- Hyatt Hotels Corporation (NYSE: H) and LATAM Hotels Corp announce the opening of Hyatt Place Managua, the first Hyatt-branded hotel in the capital city of Managua, Nicaragua. The hotel features the Hyatt Place brand’s intuitive design, casual atmosphere and practical amenities, such as free Wi-Fi and 24-hour food offerings. The hotel is owned by LATAM Corp and operated by GHL. 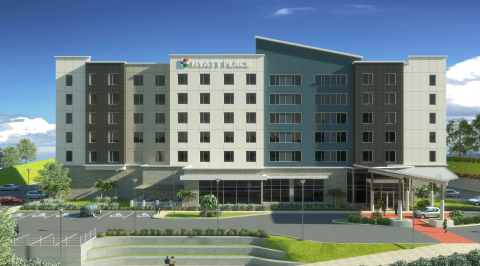 Hyatt Place Managua is the second of five Hyatt Place hotels that LATAM Hotel Corp. is slated to open in Central America over the next three years. The first hotel, Hyatt Place Tegucigalpa, opened in September 2015, and Hyatt Place Guatemala City is expected to open before the end of 2016. Previously announced hotels will be located in San Salvador, El Salvador and San Pedro Sula, Honduras. Currently in Latin America and the Caribbean, Hyatt Place hotels are located in Chile, Costa Rica, Honduras, Mexico, Panama and Puerto Rico. Hyatt Place Managua is situated along the city’s new business and shopping corridor next to Galerías Santo Domingo, one of the most prestigious shopping centers in the city. The shopping, restaurant and nightlife options that surround the hotel create a vibrant neighborhood for visitors. Hyatt Place Managua is also conveniently located near various embassies, prominent business and financial institutions, and is also 30 minutes from Augusto C. Sandino International Airport. In addition, Hyatt Place Managua collaborated with Nicaraguan artist Otto Mejia to dress its Gallery walls. The artist makes use of the traditional Nicaraguan art mediums of wood and clay. “Managua is a vibrant and culturally rich city, filled with friendly people and an ever expanding list of great places to visit and things to do or see. Our hotel is central to all of them and we are confident that Hyatt Place Managua will exceed guests’ expectations and provide them with everything they need while visiting our area,” said General Manager Rafael Correa. Latam Hotel Corporation is a Latin American company, developing a platform of mixed used projects in Central America and Mexico with strategic alliances such as Hyatt Place. Focused on first choice project locations, sustainable, efficient and modern design, respect and integration of local communities in terms of social, cultural and economic return. Latam Hotel Corporation properties will become reference points in their city, linking today’s modern travelers’ needs under one concept of lifestyle and security.